A great vegetarian main dish. If you can?t find Chihuahua cheese, substitute Monterrey Jack cheese. Soak cornhusks for 1 to 2 hours in 1 gallon of water to soften before use. To make the tamale dough, in the bowl of a standing mixer combine masa harina, salt, butter, vegetable oil and chicken stock. Mix well and add additional chicken stock if necessary to make a pasty dough. Set aside. To make the filling, heat olive oil in a large saut? pan over medium-high heat. ?Add diced onions and cook, stirring frequently, until onions are translucent and lightly browned, about 5 to 7 minutes. Add in minced garlic and cook an additional 1 minute. Add in black beans, wine, cumin, salt, chili powder and paprika and cook, stirring occasionally for 3 to 4 minutes until white wine has reduced almost completely. Remove from heat and set aside. 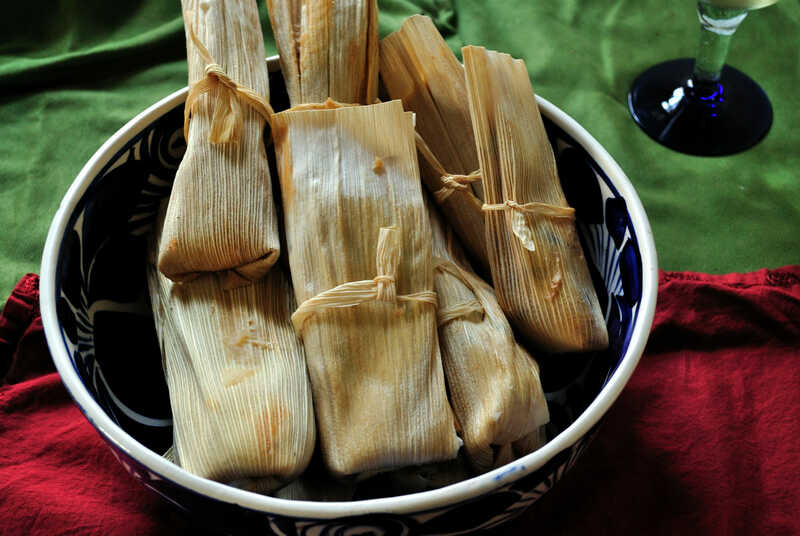 To assemble the tamales, smear the masa dough generously into each corn husk, coating all the way to the edges. Add two tablespoons of the black bean mixture to the center of the dough and sprinkle with Chihuahua cheese. Roll the corn husks closed and if needed, use a toothpick to secure the husk closed. Steam the tamales for 35 to 40 minutes until the corn husks easily pull away from the dough. Serve with sour cream and chopped cilantro.